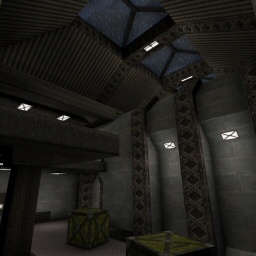 Map Description Small 3-level deathmatch arena with 6 elevators, and a secret alley to discover. Plenty of z-axis action. DM-Carnage is a small map, good for 2 to 6 players, and plays very well. The author, Hunter "Clanless" Wiebush aka ~SAC~Hunter, put a lot of subtle detail into the map to provide the public a complete map. This map is a pleasure to play for a lot of reasons: The framerates for this map are very good. The architecture is not extremely complicated, but there's just enough detail for a nice look. You'll see walkways with trim, support beams, decent light fixtures, gratings, flowing water, and a storm brewing outside complete with rain and lightning. The map has a warehouse/industrial look to it, complete with concrete block walls and steel doorways. Elevators move you around so you can take advantage of the z-axis fun on this three level design. I did not see one single bot issue. At first I thought they were incapable of grabbing the armor, which sets on top of boxes, but I finally noticed one making a leap for this goodie. The AI ride the elevators and use their newly acquired height as an advantage over the crowd below. I liked the item placement. You have to run just a little ways to find something mean to shoot with, and it seems as though the author placed the meanest weapons farthest from a spawn point. Some people will not be able to appreciate the subtle lighting techniques used in the level, but I can. A lot of work went into insuring that the lighting was appropriate to the surrounding light source, with techniques like variations on the light radii. Subtleties were not limited to lighting; many sounds filled the map, including a custom sound and music file, which made for a complete experience. For the author: I tried working with the jumpspot setup for the armor in an attempt to get the bots to air hammer to it like you intended. I gave up after a time or two, but noticed that the bots would make the leap off the ledge, as I did, for the armor. The only thing that bothers me about the map are the dark corners of the walls. Good for the moment.Simple Architecture and Layout.Bots do well and good texturing.